UNBEATEN freshman Mach Dan is set to embark on another interstate campaign. Winner of his two starts for premier Victorian trainer Emma Stewart, Mach Dan will contest a heat of the famed Bathurst Gold Crown on Saturday night. During his previous trip across the Murray River the Australian Pacing Gold purchase captured the Group Two Sapling Stake at Tabcorp Park Menangle. Kept fresh since his March 2 triumph, Mach Dan is a short-priced favourite to maintain his perfect record after drawing barrier four in the first of six qualifiers. With only 10 spots available in next week’s Final, the six heat winners and the four fastest runner-ups will progress to the Group One. Thrilled with Mach Dan’s preparation, Stewart is positive the son of Mach Three can head into the $100,000 decider on a winning note. “He has done really well since his run at Menangle and will be better again for it,” Stewart said. “His work has been solid and he is in good shape. Undefeated from three starts – including last week’s Group Two Tatlow Stake in Menangle – Mistery Road is also at skinny odds in the sixth qualifier. Co-owned and trained by John Boserio, Mistery Road has drawn barrier five. “He’s come through his run fine,” Boserio said. “Although he won, I was a bit disappointed in his waywardness, but he is still learning. “He was hanging and playing up a bit in his trials so I got a chiropractor to go over him and he was much better in his first two starts. “I got a chiropractor to go over him again yesterday and hopefully it has straightened him up a bit. While the ‘boys’ will take centre stage on Saturday night, the fillies will kick-start the carnival the previous evening. Four heats of the Tiara are on the program with the winners and runner-ups to make their way into the Final. The balance of the field will be completed by the two fastest thirds. 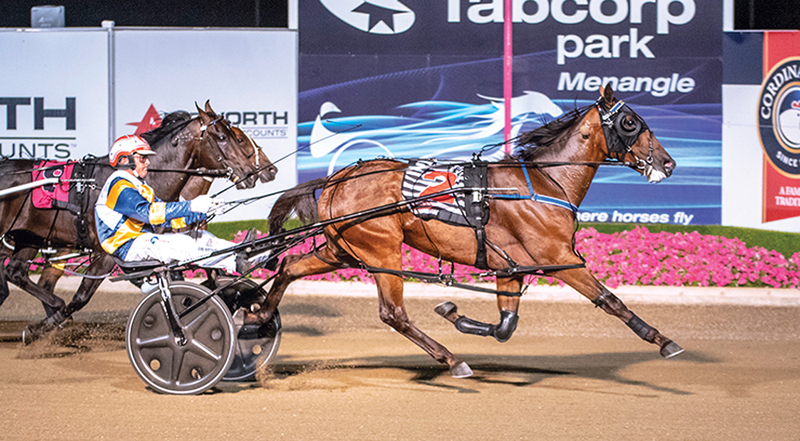 Successful in the Pink Bonnet in Menangle a fortnight ago, Eye Can Run is expected to continue her winning way from barrier five in the opening heat.